(BGF) – The Philippines’ Foreign Secretary Albert del Rosario said in a press briefing that the Philippines will “secure sovereignty” if it is challenged, as the Inquirer reported. 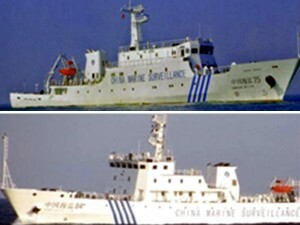 The remark is made after the Philippines Navy surveillance plane found eight Chinese fishing boats anchored inside the Scarborough Shoal, which is protected by two Chinese maritime surveillance ships. Click here to read the full article or visit the Inquirer’s website. MANILA, Philippines – The Philippines will defend its sovereignty if challenged by China, Foreign Secretary Albert del Rosario said Wednesday as a Philippine warship was locked in a standoff with two Chinese vessels. “If the Philippines is challenged, we are prepared to secure our sovereignty,” Del Rosario told reporters in a briefing at the Department of Foreign Affairs. At the same time, Del Rosario said the Philippines has filed a diplomatic protest. Del Rosario said he and Chinese Ambassador Ma Keqing met at the DFA earlier in the day to discuss the situation.